Greenore 8 year old (~€40) is an IWSC Gold medal winning Single Grain whiskey from Cooley. The raw ingredients for Grain whiskey are maize, water and yeast with a small amount of malted barley to start the fermentation process. Grain whiskey tends to have a lighter flavour than Malt whiskey and its principal purpose is to be mixed with the more flavoursome Malt whiskey to produce an easy to drink Blend. However, at Cooley they produce Grain whiskey that is good enough to drink in its own right. The result is their Single Grain whiskey, Greenore. 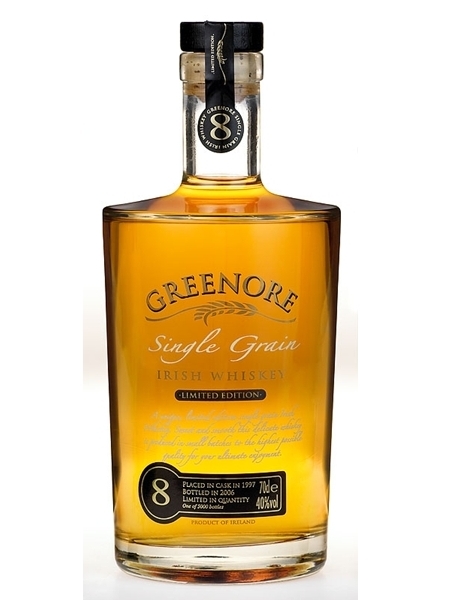 Greenore 8 is matured for at least 8 years in ex-bourbon casks and bottled at 40% ABV. The brand is named after Greenore Port, just a few miles from the Cooley Distillery.